Read for This Week’s Study: Eph. 1:18-22, Rom. 8:26-39, James 4:7, 1 Pet. 5:6-10, Luke 10:1-20, Acts 5:12-16. Memory Text: “Yet in all these things we are more than conquerors through Him who loved us” (Romans 8:37, NKJV). Key Thought: In Christ, we have victory over all forces that would oppress us. In some parts of the world, religion is basically a source of power that may be seen as nothing but a way to help one meet the challenges of daily living. The Christian notion of salvation from sin, for example, is foreign to many traditional religions. In these places, Christianity risks being seen mainly as a means to help solve the problems of everyday life. Though there are, of course, many practical advantages to a Christian’s lifestyle, we must always remember that Christianity has an “otherworldly” outlook. Christianity sees another dimension of reality beyond the material world. Both realms are important, and both host forces that are at cross purposes with each other. How thankful we can be for the promises of victory for us in both realms. Again, we stress that the overarching narrative of the great controversy between Christ and Satan needs to form the background template for our understanding of the world and our place within it as Christians. In the midst of this conflict, Christianity does not abandon its adherents to the mercy of the opposing forces. On the contrary, in Christ we have the promise of victory over those forces. *Study this week’s lesson to prepare for Sabbath, November 10. The Christian would have no hope of victory over the forces of evil unless the stage was set for it. In last week’s study it became clear that Christ, through His death on the cross and His resurrection from the grave, gained victory over all sorts of evil and anti-godly “powers.” In a very real sense, the unmasking and disarming of these “powers” have placed a limit on them. The fact that the “powers” have been brought under subjection sets the stage for the victory of the Christian. Study Ephesians 1:18-22. Paul prays for the enlightening of the eyes of the Christians in Ephesus. According to Paul, what did Christ accomplish for us? How do we understand these words in the context of the great controversy? What is promised to us here? How do we make these promises real in our own experience? Paul is praying that a new and deep illumination will accompany the Christian. When this has happened their lives will be filled with Christian hope. They will know their privileges as God’s heirs, and they will know by experience the power of God in their lives, a power that is of the same magnitude as that which raised Jesus from the dead. Notice Ephesians 1:20-22 in particular. What can we claim from these promises for ourselves and our struggles with forces stronger than we are? As a consequence of Christ’s crucifixion and resurrection, all things, including principalities and powers, function in subjection to Him. The stage is truly set for the possibility of our individual victories over all that would spiritually oppress us. Read the verses for today. What can you take from them for yourself in whatever struggles you are facing at the moment? Think about what is being said there and what is promised to us in Christ. How can this go from being mere theology to reality in our own experience? Not only is the stage set for the possibility of the Christian’s victory over evil forces, the Bible explicitly gives us the hope of victory over them. Study Romans 8:26-39. What point is Paul trying to make here? What reasons does Paul give for the Christian to look confidently to the future? Look at all the wonderful promises and words of encouragement found in these verses. Again, how can we take them beyond theology, beyond something that sounds nice, and live according to the clear teachings of the Word of God presented here? Romans 8:29, 30 has been a battleground for discussions on predestination. But the passage really occurs in the context of a great promise. Paul gives at least two solid reasons for the Christian to be confident in the Lord. First, the Spirit helps us in our trials and “groanings.” Second, according to God’s eternal purpose, all things, including trials, contribute to the Christian’s ultimate welfare (no matter how hard that might be to see at this present time). Trusting God in difficulties is, indeed, a crucial component of what it means to live by faith and not by sight. Verses 29, 30 are Paul’s way of justifying the confidence expressed in verse 28. In these verses he shows how God’s purpose for those who love Him is developed, a purpose that includes all the processes of salvation. How does Paul’s argument for boosting the confidence of the Christian reach a pinnacle in verses 31-34? Look especially at verse 31. In the context of the great controversy, what can we take from this verse for ourselves, personally? Romans 8:35-39 gives an array of entities over which the Christian can be victorious. Notice that “principalities and powers” are included in the list. The sheer inclusiveness of Paul’s list points out that there is nothing in the universe over which the Christian cannot be victorious, thanks to Jesus. Read James 4:7. What clear promise is given to the one who stands against the devil? How does one stand against a force so much more powerful than we are, in and of ourselves? See also Deut. 4:4. The Christian is not a helpless victim, at the mercy of the devil (can you see here, too, why it’s so important to understand the literal reality of Satan and the fallen angels?). But the Christian is not so much called upon to rise in opposition to the devil as to take a stand against him. The word translated as “resist” is the Greek anthistemi, which means “taking a stand against something.” It is an attitude the Christian takes that causes the devil to flee. That attitude has to be one of complete surrender to Jesus, who alone has the power to cause the devil to flee from us. Study 1 Peter 5:6-10. What promise is given to the Christian in the face of an enemy who is described as a “roaring lion” seeking someone to devour? How do these texts help us to understand what James wrote above? See also Ephesians 4:27 and 6:11. Peter wrote these words to admonish Christians who were suffering persecution. Obviously he knew that lurking behind the persecution his readers were suffering was the archenemy, Satan. The apostle admonished his readers to resist the devil. Here Peter uses the word anthistemi, as did James but adds the modifier stereoi (hard or firm). Thus, he suggests that the devil may flee from those who present a solid, rock-like front against his attacks. A cowardly attitude will not suffice. Still, Peter knows, that in spite of a strong stand, suffering may endure for a while yet; but God Himself will perfect (mend), establish, strengthen, and settle the Christian (1 Peter 5:10). Even with all the promises given here, we are not promised freedom from suffering, are we? What Christian doesn’t know the reality of suffering? As humans, we seem destined in this world to suffer. What crucial difference should our faith make for us amid sorrows and pain? So far we have been shown by the Bible the hope and promises of victory that the Christian may have. Actually beyond these, we have real examples of Christian victories over evil forces recorded in the Bible. We begin with the example of the ministry of the early disciples whom Jesus sent out. Read Matthew 10:1-8; Mark 6:7, 12, 13; Luke 9:1, 2; Luke 10:1-20. Look at what these people were commissioned to do. How are these texts to be understood in the context of the great controversy? Also, what do these texts say today to us who are called to preach to the world about Jesus? It is quite interesting that, as Jesus sent the twelve out to proclaim the gospel of the coming of God’s kingdom, He deemed it important to give them power over demons and unclean spirits. This is not surprising, because proper preaching of the gospel necessarily entails the unmasking of such powers. The manifestation of the “powers” was to be expected as the gospel would be proclaimed, hence the need to give the twelve power over them. Surely, the evil forces manifested themselves as the twelve went about preaching, and, just as surely, many demons and evil forces were cast out. As far as can be seen from the records, Jesus did not, in specific terms, commission the seventy to cast out demons. See Luke 10:9. Yet, this is the aspect of the mission that seems to have excited the seventy the most (Luke 10:17). With joy the seventy reported that as they went about preaching the gospel of the kingdom, demons were brought into subjection to them. Of course, they understood that it was the power of Jesus working through them that made this possible. Though much can be discussed and debated about these texts and the way in which they should be understood today, the important point is that, as Christians, who have been called to proclaim the gospel to the world, we have, through Christ, the power to do it. Read Luke 10:20. What important point should we take for ourselves from Jesus’ words here. How does His response show us what should be important in our lives? How can we make sure that we keep this correct emphasis? The examples of victories over demonic forces that we looked at in yesterday’s lesson happened in the days of our Lord on the earth. But the victories were by no means restricted to that period. In the book of Acts we find the continuing victories of Jesus’ followers over demonic forces. Of course, this shouldn’t be surprising, not with all the promises that Jesus left to His followers about the Holy Spirit being with them when He Himself had left (see, for example, John 14:16). At the same time, too, as we so well know, the great controversy between Christ and Satan, though settled finally at the cross, is to rage until the end of time. Thus, Christ’s followers, even after He left, were to be engaged in the conflict, especially as they sought to fulfill the gospel commission. Acts 16:16-18 presents an unusual case. When the slave girl mentioned “the Most High God,” her words expressed a great truth. Paul, though, would have none of it. He could see what was really going on. The supernatural powers that she had manifested, which were making money for her masters, were not of the Lord, and Paul knew it. When she cried out about these men being “servants of the Most High God” (NKJV), she was not talking about the true God but, most likely, about a Canaanite god who was also called Elyon (Most High). Notice how easily, merely through the use of certain common terms, error could have greatly compromised the truth. Look again at Acts 5:12-16, and that amazing part about the people hoping that “at least the shadow of Peter” (NKJV) might touch them. What warnings should that have for any Christian who is working for the Lord, especially when their work is deemed “successful”? Read Ellen G. White, “‘Let Not Your Heart Be Troubled,’” pp. 662-680, in The Desire of Ages; “Appropriating the Righteousness of Christ,” p. 93, in Faith and Works; “Science and Revelation,” p. 310, in Selected Messages, book 3. “Jesus gained the victory through submission and faith in God, and by the apostle He says to us, ‘Submit yourselves therefore to God. Resist the devil, and he will flee from you. Draw nigh to God, and He will draw nigh to you.’ James 4:7, 8. We cannot save ourselves from the tempter’s power; he has conquered humanity, and when we try to stand in our own strength, we shall become a prey to his devices; but ‘the name of the Lord is a strong tower: the righteous runneth into it, and is safe.’ Prov. 18:10. Satan trembles and flees before the weakest soul who finds refuge in that mighty name.” - Ellen G. White, The Desire of Ages, pp. 130, 131. “The omnipotent power of the Holy Spirit is the defense of every contrite soul. Not one that in penitence and faith has claimed His protection will Christ permit to pass under the enemy’s power. The Saviour is by the side of His tempted and tried ones. With Him there can be no such thing as failure, loss, impossibility, or defeat; we can do all things through Him who strengthens us. When temptations and trials come, do not wait to adjust all the difficulties, but look to Jesus, your helper. “There are Christians who think and speak altogether too much about the power of Satan. They think of their adversary, they pray about him, they talk about him, and he looms up greater and greater in their imagination. It is true that Satan is a powerful being; but, thank God, we have a mighty Saviour, who cast out the evil one from heaven. Satan is pleased when we magnify his power. Why not talk of Jesus? Why not magnify His power and His love?” - Ellen G. White, The Desire of Ages, pp. 490, 493. Take some of the examples from this week that show the victories revealed in the Bible. In what ways do we see similar things happening today? What can we do, if anything, to see more of them? What does it mean to “draw nigh unto God,” as Ellen White quoted above? How do we do that? Discuss in class what it means, how you do it, and what happens when we do? Imagine that you are Peter, and people want to merely be touched by your shadow. Think about what that could do to you spiritually. What’s your only safety in a situation like that? Fabrice knew nothing of God or Jesus. As a fisherman, he spent weeks at a time on board a ship. One day one of the sailors gave him a book about God. He read it with great interest. Following the book's instructions, Fabrice prayed his first prayer. Fabrice wondered which Christian faith was the true path to God. He really didn't know who God was or where to find answers to his questions, but he continued praying in the only way he knew. Then while visiting a friend, he met a young woman who was staying in his friend's family. Fabrice realized that she was somehow different, and he learned that she was a Seventh-day Adventist Christian. He told her of his search for God, and she invited him to church. The couple was married, but Fabrice's job kept him away from home and slowed his search for God. He and his wife prayed for work that would allow him more time at home, and God answered. With more time together, Fabrice's wife gently guided her husband to a total commitment to Christ. Fabrice wanted to share his new faith with others, but he didn't know how. The local mission sent him to a lay training seminar, and his faith grew as he shared what he had learned. Fabrice and his family were called to work as Global Mission pioneers in a remote region of northern Madagascar. He worked with the villagers in their fields to gain the people's trust, and on Sundays the couple held literacy training programs. In time 33 people were baptized. When the family's two-year contract was up, the family returned to their home. 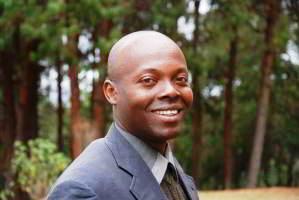 Fabrice worked as a lay pastor. He had a passion to work for God and wanted to become a minister. But with a family to support, his dream seemed impossible. Then the local mission offered Fabrice a scholarship to study for the ministry. He was thrilled, but it meant huge sacrifices for his family. Fabrice had to leave his family behind while he prepares for the ministry at Zurcher Adventist University in central Madagascar. He works hard to provide for his family's needs and pay his remaining school fees. "God stretches the little bit I can earn to provide for us all," he says. "It's worth it to become a fisherman for God." Part of your Thirteenth Sabbath Offering last quarter will help provide classrooms for Zurcher Adventist University, so that it can continue to train leaders for service to God in Madagascar. Thank you. Fabrice Jaovoavy is studying theology at Zurcher Adventist University.